Peter Rucker is said to be the first of the Rucker line to come to America. He was born in Germany and his family fled to France during an uprising in their native land. Peter and his 3 brothers boarded a ship traveling along with 3 other ships to come to the new land and reached the shores of Virginia in the late 1600’s. There are several stories as to how Peter arrived here. A great storm arose as they were approaching land and it is proven that one of the ships sank before reaching the dock. This is where things change. The debate is how Peter, who was on the sinking ship, got to shore. Below are some of the accounts that can be found. I really like number 6 as this would be a great story to tell! 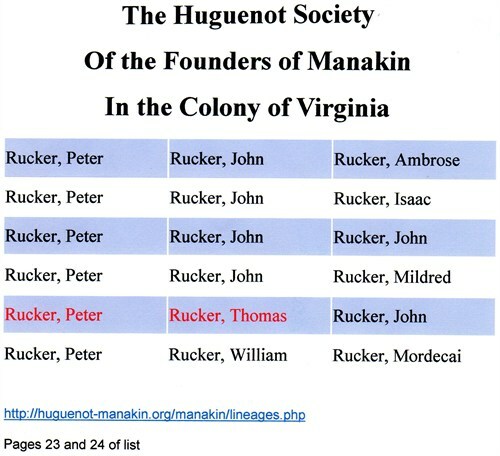 Peter Rucker is my 7th Great Grandfather.